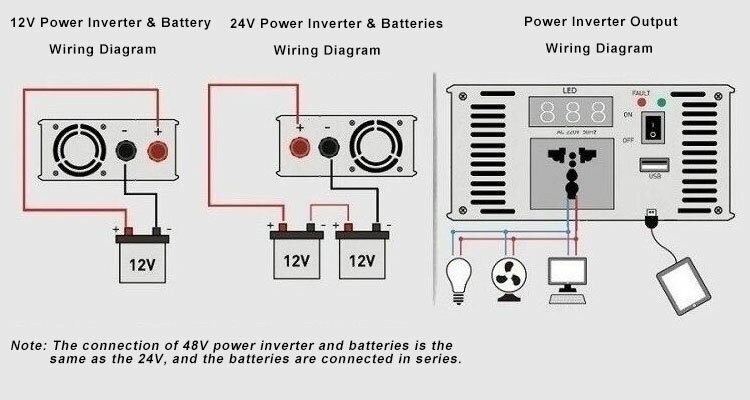 1000W pure sine wave power inverter is desighed to convert DC to AC with battery over/under voltage, overload, overheat, AC short circuit protection, universal AC outlet and USB port for multi-purpose charging, safe charging design etc. to power and protect your device for home and car. Tips: How to place a car inverter better? First of all, the car inverter should be far away from water, so there is no teacup nearby. Once there is any sudden braking during driving, the tea is easy to splash out of the cup, especially the unsealed tea cup. Once the splashed tea falls on the inverter, the entire inverter will be destroyed and need to be repaired. Besides, it cannot be installed in a place where it can easily splash into the rain. Secondly, it is not allowable to place the car inverter near the sun or near the heater outlet. As the relevant data showed, it is better that the operating temperature of the inverter is not more than 40 degrees. Once the temperature gets high, various problems may occur to the inverter. Finally, a ventilated, dry environment is necessary. Ventilation and drying can make the inverter work more smoothly. Besides, make sure that there is not much room for debris in this area. Of course, be sure to keep away from explosive flammable substances, otherwise it is easy to produce a variety of disasters because the car inverter will generate heat when operating. This 24v to 120v power inverter works great in my truck. This 24v to 120v power inverter works great in my truck. It’s really helpful to charge my phone and laptop when driving outside. Power inverter is good value for the money. So far this is doing a nice job. Last weekend my wife and I went a car trip and we used it to charge our iPad and cellphone. It worked as expected. Good value for the money.